Coverage: Watch live across BBC One, BBC Two, BBC Red Button, Connected TV, the BBC Sport website and mobile app. World number three Ding Junhui took less than an hour to get the four frames he needed to beat Xiao Guodong 10-3 and secure a place in the last 16 of the World Championship. The 31-year-old led 6-3 overnight and made breaks of 61, 78, 51 and 98 to cruise past his Chinese compatriot. A pot rate of 93% piled the pressure on his 29-year-old opponent, who had led 2-0 before Ding seized control. Ding plays Scotland’s Anthony McGill or Welshman Ryan Day in the second round. 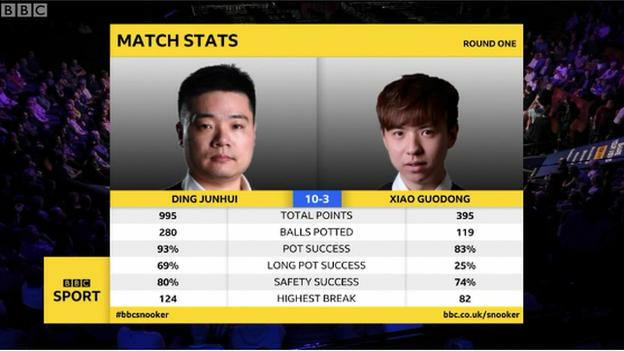 The match against world number 14 McGill or Day, ranked 17th, will be the ninth time Ding has made it beyond the first round at the showpiece event at the Crucible in Sheffield. Ding looked in sensational form in his first-round demolition of qualifier Xiao, scoring one century and seven breaks of more than 50 as he wrapped up victory during Tuesday’s morning session. “I scored heavy. I started very strong and just tried to play my shots,” the 13-time ranking event winner said. “The crowd supported me a lot. “I am confident with my form and playing well, scoring well and playing good safety. I am happy. The afternoon session saw qualifier Ricky Walden close out a 10-6 first-round victory over Belgium’s Luca Brecel. Walden opened with a ton on his way to stretching his 6-3 overnight lead to 8-3, but world number 13 Brecel suddenly began to play with greater freedom and took three in a row to trail by just two at 8-6. But Walden, a Crucible semi-finalist in 2013, won a painstaking 15th frame before getting over the line to set up a second-round meeting with a Judd Trump or Chris Wakelin. Double world champion Mark Williams leads Sussex potter Jimmy Robertson 7-2 after their first nine frames. The Welshman, twice a ranking event winner this season, won the opening two frames and went 3-1 to the good with a stylish 102. World number 34 Robertson failed to make the most of numerous good opportunities and seventh seed Williams continued to take full advantage and gain a commanding lead for Wednesday’s decisive session. Stuart Bingham trails fellow Englishman Jack Lisowski 5-4 after the morning session. Cheltenham’s Lisowski took a three-frame lead over the 2015 champion, before the Essex cueman won the final two frames. Bingham had a chance of a maximum 147 break in the ninth frame after potting 11 reds and 11 blacks, but missed the 12th red with the rest. That match plays to a finish in Tuesday’s evening session, when another former champion, Neil Robertson, will also be in action against Robert Milkins. Why has the Crucible banned football shirts? I fancy Ding to win it – and did before the tournament started. He’s lost tough matches in the past two years to Selby but he’s no longer here and I like the fact Ding said he thinks he’s the favourite for the tournament. He took out Ronnie last year and the thing he has above everyone, apart from Ronnie, is consistent scoring over long distances. He also has the best cueball control and if he finds 85% of his game he will take a lot of stopping. He is the right age and I think he desperately wants to win this. He has all the t-shirts apart from this one.